PITTSBURGH (AP) — Kevin Stallings and Scott Barnes took turns standing at the dais plopped down near center court inside the Petersen Events Center last March ticking off the reasons — well, reason, mainly — Stallings left Vanderbilt after 17 years to become the head coach at Pittsburgh. The deciding factor, said Stallings and Barnes, the Panthers’ athletic director at the time, was the legitimate chance to reach the Final Four . Ten months later, it has never seemed farther away. Barnes sprinted west for the same job at Oregon State earlier this month and the most significant hire of his brief tenure is off to a bumpy start. Stallings’ already difficult first season reached an ugly and historic nadir on Tuesday night, when the Panthers were blown out 106-51 by No. 13 Louisville. In the program’s 112-year history, only once has Pitt been beaten by more: a 106-13 loss to Westminster College in 1906 back when play had to be stopped after every made basket to fetch the ball out of the hoop. Not that Stallings stuck around to see his team fall to 12-8 overall and 1-6 in the Atlantic Coast Conference after dropping its fifth straight. He was ejected for arguing with officials with 14:27 to go, leaving assistant Tom Richardson to endure the rest of a defeat so one-sided Louisville coach Rick Pitino spent most of his postgame comments doing something for Stallings that Stallings’ players apparently had no interest in doing: sticking up for him. One that’s proven far rockier in its early stages than Stallings imagined when he took over after Jamie Dixon bolted for TCU, his alma mater, after 13 largely successful seasons making the Panthers NCAA Tournament regulars. Stallings promised a more free-flowing offensive style than his more buttoned-down predecessor, a philosophy the starting group that features four seniors quickly embraced. It’s the other end of the court that’s been the bigger issue. The Panthers are last in the ACC in field goal defense and next to last in points allowed, numbers that ballooned after the Cardinals shot 71 percent from the field in the first half while building a 51-18 lead. “I don’t understand how you don’t dig in and compete harder,” Stallings said. A problem that popped up intermittently before Tuesday night. 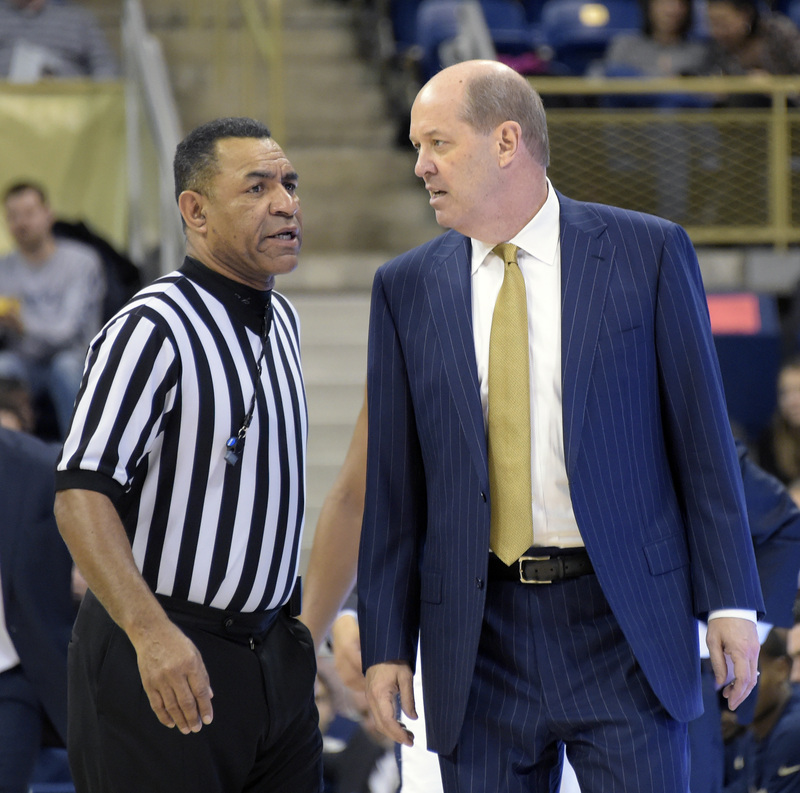 Pitt needed double-overtime to edge Eastern Michigan in the opener then lost to crosstown rival Duquesne for the first time since 2000 in December, a game in which star forward Jamel Artis sat out for a violation of team rules. The Panthers opened ACC play with a last-second loss to Notre Dame but responded by pulling away late to top Virginia. It proved to be a mirage. Five straight defeats have followed in the meat grinder that is the nation’s toughest conference. An injury to reserve forward Ryan Luther tested Pitt’s already limited depth and senior forward Michael Young is gamely trying to play through a fractured orbital bone, even wearing a mask borrowed out of a horror movie in a lifeless 72-46 thumping at the hands of Miami on Jan. 14, the worst defeat in the 14-year history of The Pete. The mark stood for all of 10 days. Given a week to prepare for the Cardinals, Pitt fell behind by 12 points less than 7 minutes before the bottom completely fell out. Even Pitino acknowledged he was “shocked” at how quickly things snowballed in an arena that for the better part of a decade was notoriously one of the most difficult and raucous places to play in the country. Not so much anymore. While “The Oakland Zoo” student section remains packed for conference games, enthusiasm in the rest of the gym has faded quickly. Only 8,971 showed up on a mild January night (by Pittsburgh standards) to watch what used to be a standing-room only showdown between Big East heavyweights not so long ago at the 12,500-seat arena. The Panthers are averaging just 7,705 fans per game at the Pete and save for a visit by North Carolina on Feb. 25, the remaining five conference home games are unlikely to generate much buzz. Compare that to 11,004 fans during Pitt’s initial season in the ACC in 2013-14. Immediate help doesn’t appear to be on the way. Stallings questioned the leadership of his players before facing the Cardinals and they responded by getting steamrolled. Sitting his starters, however, isn’t an option. For all of Dixon’s on-court success, Pitt’s recruiting faltered during his final years on the job. The Panthers’ bench is averaging just 10 points a game during conference play, and 4.3 of those have come from Luther, who remains out while his injured right foot heals. Pitino tried to offer perspective, pointing out his first season at Kentucky in 1989-90 included a 55-point loss at Kansas. Time for the current group of Panthers to do it is running out. Quickly.